It may be logistics, IT, ecommerce company or any other industry there is a need of different softwares to handle work in different departments. Like a HR department, accounting, Marketing team, Development department, etc. And what if you want information from a particular department then you have to extract data from that particular department. That is how the system works and in this process it takes lot of time, where much manual work is needed. So to reduce that Enterprise Resource Planning system has been introduced which will reduce 50% of manual work and the data will be synced and provides a single channel for the flow of data for quick watch on data. It does integrates operational process with the software It is the dynamic system from where one can operate the data online under one roof from every department. By changing to open source ERP system a company can be flexible with the architecture customization with the changing requirements in upcoming years. These days people are looking forward to adapt Open source ERP whereas, some of them are fearing about the time lag in company’s proceedings as adapting a new system itself is a huge task and everything needs to be changed. It takes time to learn new ERP system so, there are people who backstep in making big decisions like ERP adaptation for the company. ERP implementation is a critical process which the companies are yet to aware of. It requires training of the technical team to reduce the costing and time lag. 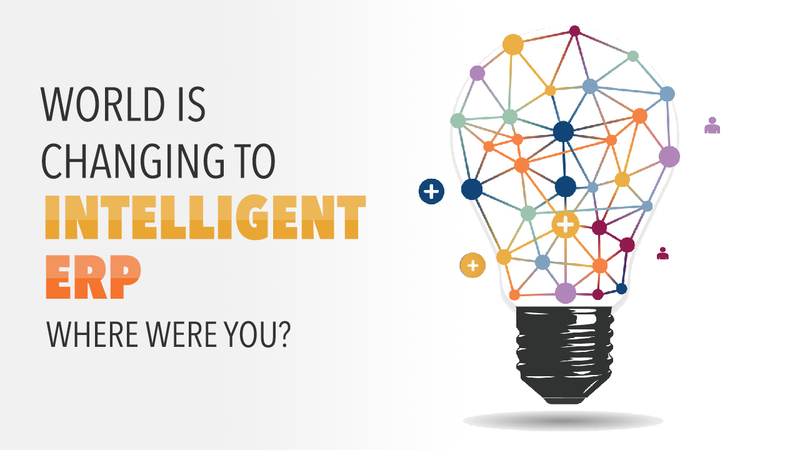 intelligent ERP gives you the core analytical view. It gives business visibility to the staff of an industry. Cloud ERP name itself suggest that it gives real time reports. By measuring the statistics it gives you the deep analysis of the product reports and market. It includes machine learning where one can work on company resources and business process by studying and analysing the reports available there. For the development of your business one can work on predictive solutions by sketching the business plan for greater efficiency. Using ERP, tasks can be handled more swiftly and easily by providing better UX thereby reducing manual efforts. Whenever we suggested clients about our Open source ERP solution services they hesitatingly decline about the idea of Open source ERP, which could be a huge change in the whole operational system. But we told them that, it will definitely take some time in doing all these but later it will be more easy to access and keeping an on future if you take this big decision then that’s cool. One of our executive went to bank there few people operating the data with different software and most of them were using different one.
" So, he enquired, why there is a difference in usage of softwares? He said I have been using this since a very a long time and now bank brought some changes and introduced new software. So those who learned new one are the fewer bunch and they are accessing it. But including me most of my colleagues are using the older and we got used to it hence it’s more easy to handle the data with the old one. " Here, the larger crowd is not ready to accept the new changes and still continue doing the old tedious work. On the other hand fewer guys chose to adapt the new change and operating the system to make their work less lengthy. People often tend to escape the new challenges. This is called escapism where people don’t accept that there is a problem and it need to be resolved and to solve this they need to learn operation of new software. Where they have to put efforts so they simply escape by saying no it’s new to us and we are accustomed to it so, we will work on same old system.
" Remember the painful speech of Nokia CEO where he spoke about, World changing too faster than them. Nokia, couldn’t change themselves with the time, couldn’t learn, so missed the opportunity of being getting bigger and not only that, they got out from the race of survival. " We all know why it happened and it is a big lesson for all of us. When the competitive world around us is changing then why we should not change our business system that could save more of time for being more productive.